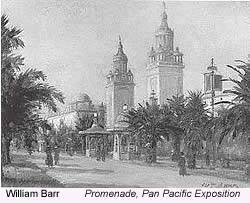 The Panama Pacific International Exposition (PPIE) was a world’s fair held for almost the full year of 1915 in San Francisco, California. The Exposition commemorated the completion of the Panama Canal and the 400th Anniversary of the discovery of the Pacific Ocean by the explorer Balboa. The occasion was also a celebration of the city's recovery from the 1906 earthquake and fire. San Francisco was only one of many cities hoping to host the PPIE, New Orleans being the primary rival. Proximity of the San Francisco site to a world-famous shipping gateway was much touted, noting that nations of the world would be able to bring their offerings through the Golden Gate, avoiding long continental hauls. San Francisco was also advantageous for aquatic displays and access by the navies of the world. After a long competition of advertising and campaigning, President William Howard Taft announced the choice of location in 1911 and construction began shortly thereafter. Every state in the Union was represented with a building, and the event became a significant factor in the economic recovery of San Francisco, a city that had been nearly destroyed by the fire and earthquake of 1906. The exposition was a tremendous success, despite taking place during World War I (1914-1918), and did much to boost the morale and economy of the entire Bay Area. The war, as was to be expected, narrowed the range of foreign exhibits, but almost every nation in the world was represented, and twenty-two foreign governments had buildings, Great Britain and Germany being the two most prominent exceptions. What gave San Francisco a particular charm, for both residents as well as casual visitors to the Exposition, was a pervading atmosphere of freedom. For many years California had been accessible to the rest of the Union only by mail-coach or pony express across the plains, or a tedious voyage of weeks by way of the Isthmus or Cape Horn, and it was still regarded as an area remote from some of the currents of American life. San Franciscans were largely free from conventional restraints, and had no dominating social caste to limit them. Perhaps not immediately perceived, however, was that underneath residents’ energetic pursuit of wealth, lavish expenditure, and moral relaxation lay a profound and strenuous concern for art, for music, for literature. This sense of freedom of expression, for California artists, was to have real significance in the development of American art. Where the Exposition should be located within San Francisco was much discussed, with many people feeling strongly that the site should be Golden Gate Park. However, it was decided to landfill the mud flats at the northern end of the city, which created 635 acres, today known as San Francisco’s Marina district. Much of the landfill consisted of debris from the earthquake. The fair, which included a large concession area, occupied 76 city blocks. The San Francisco Exposition, taken as a whole, was different from its predecessors. On its historical and practical side the Exposition commemorated and celebrated the opening of the Panama Canal. No event in American history had appealed so powerfully to the imagination of the Pacific Coast as had the construction of this great waterway. The Canal stood as a triumph of man over nature, a new linking of the East and the West, a new step towards national unity, and a marking off of the Old time from New. The Panama Pacific Exposition was to intended to display examples not of all that the world had ever done, but rather the choicest of what it had accomplished during the decade during which the Canal was being built, the opening of a New time. Like the architectural and artistic scheme of buildings and grounds, exhibits were to display the latest word, the newest thought, a New day for the New World. It is significant that the architecture, which sought to embody this symbolical conception, found its inspiration so largely in the Orient and the Moorish age of Spain. The designers appeared to seek, next to spaciousness and even vastness, color and sensuous beauty at once mystical and commanding. There were hundreds of buildings, but the most unforgettable and tallest was the ‘Tower of Jewels’, which had 43 stories and was covered by more than a hundred-thousand colored glass ‘jewels’ that dangled individually to shimmer and reflect light as the Pacific breezes moved them. Most of the buildings were built for temporary use and had wood foundations and exteriors of plaster and burlap-fiber-like material designed to last only the duration of the fair. The only building that San Franciscans chose to leave standing at the termination of the Exposition, and today its most visible remnant, was the Palace of the Fine Arts, designed by noted architect Bernard R. Maybeck (1862-1957). Last of the exposition buildings to be erected, Maybeck’s Palace of Fine Arts exhibited the work of living artists, dominated by the Impressionists. Originally made out of plaster, it was rebuilt with permanent materials in the 1960s, and today houses the city’s Exploratorium Museum. A strict eight-color pastel theme at the Exposition gave the buildings an appearance of architectural unity. Enhancing them were 1500 sculptures and murals and 30,000 imported plants, trees, bushes and flowers. (70,000 rhododendrons alone!) Landscape architect John McLaren, who had previously designed Golden Gate Park, was in charge of the exposition's landscaping, and worked closely with the many different architects involved in the project to ensure a harmonious appearance. Tremendous lighting effects were achieved with an overall illumination scheme designed by General Electric. There were thousands of carefully positioned colored spotlights, giving the buildings a magical look in the evenings. The most famous lighting strategy used at this fair was a barge that floated out in the San Francisco Bay, packed with 48 beaming searchlights, that projected seven colors of light up into sky. 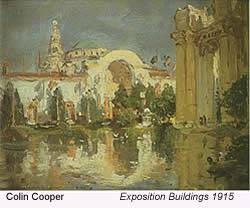 One of the many lasting effects of the 1915 Exposition was the recognition, both international and national, it brought to artists and their work, and specifically to art activities in California. For the first time, visitors could see a representative exhibition of modern art from all the art centers of the world. In particular, they were exposed to the Impressionists and their use of color, spontanaety, and disregard for rigid scholastics. The stage was set, and seeds were sown for the development of American-style Impressionism, fauvism, expressionism, and all that was to follow. For the display of artwork, there were galleries for the United States and foreign countries including England, Norway, Chili, Spain, Austria-Hungary, the Philippines, and the Netherlands. Countries such as France exhibited in the International Section, as did the Italian Futurists. 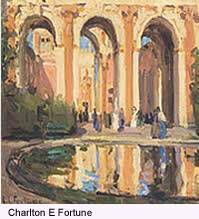 During the year following the Exposition, from January 1 to May 1, 1916, the San Francisco Art Association and the San Francisco Institute of Art continued to exhibit the Exposition’s art in the Palace of Fine Arts. For a large proportion of the thousands who made the trip to the Exposition, it was little less than a new discovery of America. Thousands made the journey, in whole or in large part, by automobile, and learned to their surprise that there were good roads, good hotels, cultivated people, and imposing scenery beyond the Mississippi. 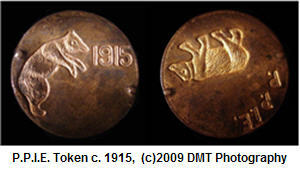 Many went on to the Panama-California Exposition at San Diego, also held in 1915. Because of their travels to and from the Exposition, as well as art and other exhibits they witnessed there, to some hundreds of thousands of the American people the result was an enlarged vision of their own country, culture, and of the world's life and interests. Thanks to Guy Sbar, M.D. for use of his original illustrated catalogue of the Post-Exposition exhibit.